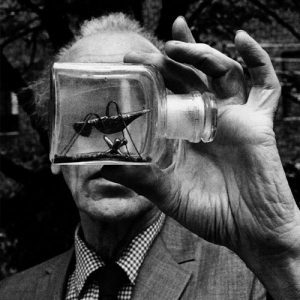 Joseph Cornell is an artist who defies categorisation. He was considered one of the earliest American Surrealists, despite having no interest in the psychological dimension of their work, as well as being linked to the artists of Abstract Expressionism, despite creating artworks from found objects, avoiding any gesturality or brushwork. Cornell’s collages and assemblages are enchanting reliquaries of nostalgia and imagination, where the everyday is taken and transformed into something ephemeral, transcendental, and yet often playful. Cornell said that his idea of happiness was, ‘quickly being plunged into a world in which every triviality becomes imbued with significance,’ a term which would equally apply to his own work. It was in the 1930s that Cornell came to prominence within the rarefied world of the New York avant garde. Having lived most of his life in a simple house on Utopia Parkway in Queens, where he would spend the rest of his years, his imagination had nonetheless been fired by images and accounts of more distant realms. In 1931 Cornell, who had already been a timid visitor to Julien Levy’s New York gallery, showed the dealer some of his own collages, inspired by the works of Max Ernst. By the beginning of 1932, Levy’s recognition of Cornell’s talent had resulted in his being included in a group show, Surrealism, alongside works by artists such as Marcel Duchamp, Salvador Dalí and Ernst. Cornell even designed the exhibition catalogue. Within a short time, as more and more European Surrealists made the trip across the Atlantic to New York, Cornell found himself at the heart of a vibrant network of artists, many of whom were soon to become household names. Cornell’s inclusion in the 1936 show, Fantastic Art, Dada, Surrealism at the Museum of Modern Art, New York, led to his work being acquired by ‘Chick’ Austin, the director of the Wadsworth Atheneum. It also cemented Cornell’s position as one of the most prominent homegrown Surrealists in the United States, despite the conceptual distance he retained from his European counterparts. Cornell would, over the years, become linked to the Abstract Expressionists and be seen as a precursor of Pop Art, elevating the everyday to the status of a relic. His own works were profoundly idiosyncratic—they were highly personal investigations of a profound mythology that touched upon foreign travel, ballerinas, actresses, artists and other subjects besides. While he remained largely rooted to Utopia Parkway and Manhattan, his mind wandered through countless realms. His love of the celebrities of stage and silver screen was also woven into his works. Cornell paid tribute to these stars in his own films; however, his boxes in particular became miniature universes filled with romance, adulation, and innocent infatuation. This reflected a pattern of impossible or imaginary relationships that repeated itself throughout his life. Similarly, Cornell struck up mysterious and intense friendships and correspondences, for instance with celebrities who featured in his works such as the dancer Tilly Loesch, with waitresses and girls-next-door, and with other artists, such as Dorothea Tanning. In particular, he struck up a possessive friendship with the Japanese artist Yayoi Kusama—whom Cornell’s mother tried repeatedly to keep away from him. Cornell’s brother and then his mother died in quick succession in the mid-1960s. Cornell himself continued to work, but was increasingly unwell himself, and focused primarily on collage for the last half decade of his career. Over the years, his home had become an archive, a depository for objects, books and images that were upcycled into his collages and assemblages. A number of these archival objects are now held by the Archives of American Art in the Smithsonian Institution, Washington DC. Clock faces, clay pipes, marbles and old prints would find themselves reincarnated as elements within complex arcade game-like objects, with opaque yet evocative rules. Often, the sense of passing time is precariously present, be it in the form of sand, as though the work were a metaphysical hourglass of some kind, rolling balls, or implied bubbles that might burst at any time. There is a gossamer-like fragility to the thread of Cornell’s vision that renders it all the more fascinating and enduring. Many of his objects have moving parts that invite the viewer’s participation, while they also often feature details on the sides less easily seen, for instance the backs of the boxes. They are objects to be endured, read and experienced, games that somehow give access to his world.